Then-Broward County Sheriff's Deputy Scot Peterson, who was assigned to Marjory Stoneman Douglas High School during the Feb. 14, 2018, shooting, is seen in this still image captured from the school surveillance video released by Broward County Sheriff's Office in Florida, March 15, 2018. The Broward County, Florida Sheriff's Office publicly released surveillance video Thursday that shows Deputy Scot Peterson remained outside Marjory Stoneman Douglas High School with his handgun drawn as a gunman went on a shooting rampage inside that killed 17 people. Peterson's failure to enter the school while the massacre was under way fueled criticism of law enforcement officials over earlier warnings that 19-year-old accused shooter Nikolas Cruz posed a threat. The sheriff's office said in a press release "the video speaks for itself." Sheriff Scott Israel criticized Peterson, assigned as a school resource officer, just over a week after the shooting, contending Peterson should have gone "in, addressed the killer, killed the killer." 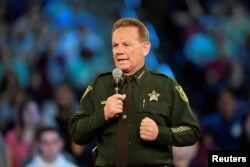 FILE - Broward County Sheriff Scott Israel speaks before the start of a CNN town hall meeting in Sunrise, Florida, Feb. 21, 2018. The 54-year-old Peterson, who retired instead of agreeing to a suspension, is still being investigated by the sheriff department's office of internal affairs. Peterson has denied any wrongdoing and his lawyer said shortly after his retirement that his client believed the shots were being fired from outside the school. The video released Thursday did not have sound, but radio transmissions appear to indicate the 32-year veteran deputy was almost immediately aware the shots were fired inside the building. A Florida judge earlier this week agreed with news outlets that the video should be released, despite resistance from police and school officials who felt it should have been held as evidence in an active investigation. Video of what occurred inside the school during the February 14 shooting was not released. Cruz faces multiple murder and attempted murder charges. A judge entered a not guilty plea on his behalf. His attorney has said Cruz would plead guilty if prosecutors would not pursue the death penalty, which they have refused to do.